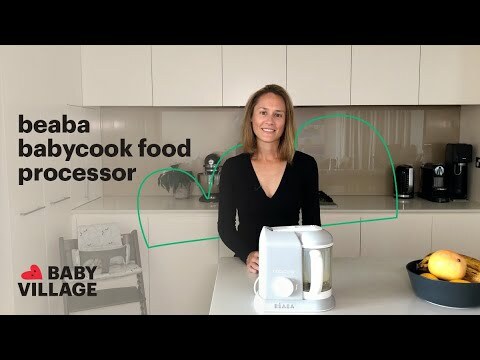 The incredibly clever and stylish 4-in-1 Beaba Babycook food processor steam cooks, blends, defrosts and reheats. Manual cyclone-effect blade: For tailored mixing, adapting the consistency to the child’s age (smooth, pureed, chunks). Removable steaming basket: Possibility of collecting cooking juices rich in vitamins and minerals to modulate the texture of the preparation. Graduated measuring bowl: Easy to measure quantity of water to pour into tank. Automatically switches off with light and sound signal when steaming is finished: No monitoring required. Removable lid: Easy to clean. Single control button (cooking – mixing): An ultra-compact solution. Security lock of bowl: Click sound ensures secure locking. Cycle meter with descaling indicator: Warning light. Spatula: Practical to remove the steam basket, stir and empty food into the bowl without being burnt. Removable blending/smoothie filter lid: Easy to clean.